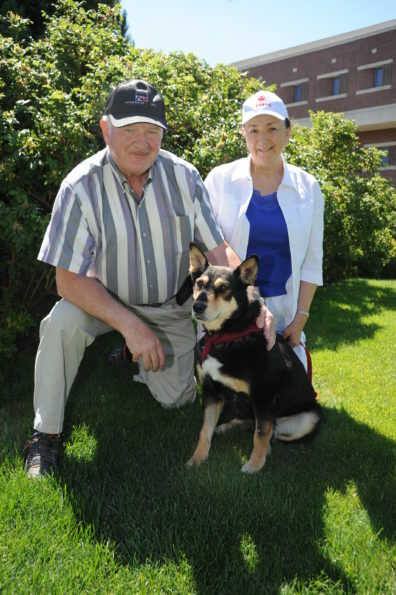 by Marcia Hill Gossard ’99, ’04 Ph.D.
After noticing an odd lump on his dog’s head in the spring of 2013, Joel Greenhalgh of British Columbia, Canada, took Mr. Bear, a then 11-year-old Australian Sheppard-Rottweiler mix, to his local veterinarian. At first the advice was to watch and see, but when it didn’t go away, his veterinarian took a biopsy. Mr. Bear had cancer. The Canadian oncologist referred Mr. Bear to WSU. Neurologist Dr. Annie Chen and fourth-year veterinary student Beryl Swanson at the WSU Veterinary Teaching Hospital examined Mr. Bear and got him in right away for an MRI. “MRI is the best way for us to evaluate the brain,” said Dr. Chen. Originally, Mr. Bear’s local veterinarians had believed he just had a lump on the outside of the skull, but the MRI results showed that the cancerous skull tumor was also growing into the skull and pressing on the brain. Dr. Chen and her team took MRI scans from different angles and used different techniques to see the exact location of the tumor and where the blood vessels were. “We needed to know how far the tumor had extended,” said Dr. Chen. “To know up to the millimeter is very important.” By knowing where the edges of the tumor were, Dr. Chen could better explain the benefits and risks of the surgery. She also saw the tumor was growing very close to a major blood vessel, which added to the risk. But the MRI made all the difference. “By having the images, we felt confident we could approach that area and do the surgery,” said Dr. Chen. After long and very delicate surgery, they removed more than 90% of the tumor. Because Dr. Chen knew where the vessel was from the MRI scan, she was able to tease the tumor away from the vessel and not tear it. WSU oncologists followed up with radiation to kill the remaining cancer cells. “WSU saved my dog’s life,” said Joel Greenhalgh. 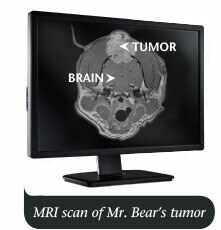 Read Mr. Bear’s full story and learn more about the MRI campaign. Update: In December 2014, Mr. Bear passed away, but he enjoyed 1 ½ years with his family after the surgery. Joel Greenhalgh’s parents, David and Vernie, of British Columbia, Canada, who drove Mr. Bear more than 400 miles for the MRI. The MRI scans were critical for Mr. Bear’s life-saving surgery. MRI scan of Mr. Bear’s tumor. Mr. Bear was one of more than 200 dogs that received a MRI scan in 2013 alone.